A redesigned Yummly app will create recipes from your groceries. Back in 2017, appliance giant Whirlpool bought Yummly, the smart recipe network that hosts over 2 million recipes. Now, the pair is showing off what the future of the partnership will look like by the second half of 2018, as both try to reverse the trend of everyone getting takeout for dinner. Yummly's app has been reengineered with computer vision smarts that'll come in handy when you've got a half-stocked refrigerator and no idea what to eat. Use your smartphone's camera to scan all the items in the coolbox and its computer vision chops will divine a recipe for you. Once you've decided what you're going to cook, the information will be pushed to one of a new range of Whirlpool cookers. 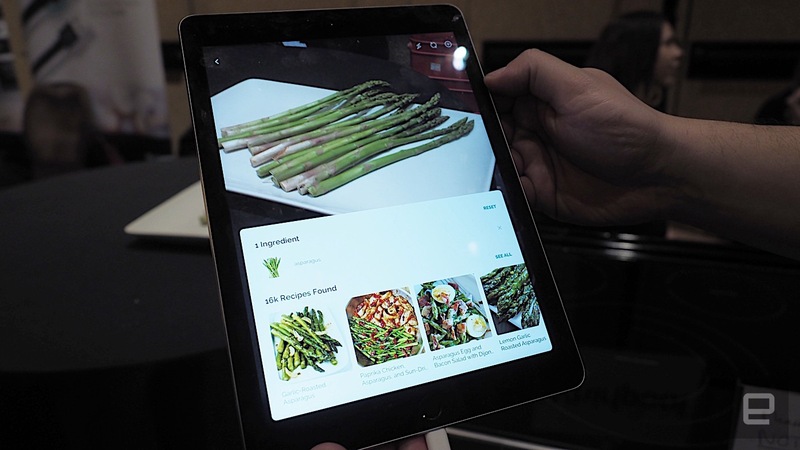 A small, five-inch-wide touchscreen on the stovetop will then display step-by-step instructions for each phase of the recipe. So, it'll tell you when you've got to throw your chicken, or asparagus, into the pan, and then, when the requisite time has elapsed, tell you to turn it over. And, the hope is, you'll be able to churn out better-looking and better-tasting meals with what would otherwise go to waste. Unfortunately, the future of cooking is still a few months away, and even when it gets here, it's going to be at the higher end of the price spectrum. But it's something to bear in mind when it comes to getting your kitchen replaced in the next couple of years.